Congratulations! Some mighty interesting topics there . Its always awesome to share and enjoy creativity. Cheers! 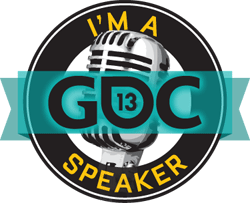 Will the slides (or any other readable material) of the session be available after GDC? Went to your talk, I really liked your focus! Though I tried to write down as much as I could from you presentation, it would be awesome to have your slides as reference. Any chance you can put the online? They just went online yesterday.